2879 Broadway, at 112th St. The first floor of this sprawling bookstore offers more than 5,000 volumes of fiction for kids 8 to 15, including the city’s largest selection of foreign-language books for children. Parents love the second floor for its numerous test guides (for everything from the ISEE to the SAT) and parenting manuals. Many branches of this ubiquitous super-chain have a section just for kids: Barnes & Noble, Jr. It usually takes up half a floor and offers more than 15,000 children’s titles. The Website is also impressively organized, with a special section just for kids’ stuff. 983 Lexington Ave., at 71st St. Kids feel special climbing the three-step walk-up to the semi-private children’s section of this snug store, where classics like Curious George rub bindings with imports like The Red Balloon. There’s also a nice assortment for preschoolers—coloring books, pop-ups, and pocket-size books galore. This cozy, independent Cobble Hill storefront devotes a whole separate room to children’s books, with a well-rounded selection of classics and new releases for youngsters through young adults. About once a month, kids-oriented illustrators and authors give readings, and the store also frequently holds fund-raisers for local schools. The rear space of this neighborhood hangout for bibliophiles is decorated in moons and stars, with stone tables and chairs, as well as kid-size shelves. Selection is pretty mainstream (Shadowmancer and Harry Potter are favorites) and based on requests from local tots. The store holds Tiny Tea Birthday Parties on Sundays for girls, and monthly story hours for kids 2 to 7. 16 W. 18th St., near Fifth Ave. This impeccably organized store offers everything from pop-up books, New York City–inspired books, and fantasy and medieval tales to Greek mythology and science fiction, not to mention classic kids’ favorites. Locked up in glass cases are first editions of classics ($100–$9,000). Story time is every Sunday at noon. Fans swear by this chain’s selection. For beginning readers, there’s the wholesome Junie B. Jones and the sillier Captain Underpants series; middle-schoolers who have surpassed Harry Potter love the dark-humored A Series of Unfortunate Events. Browse warehouse inventory on in-store computers; many books can be shipped to a store near you in a day. 1313 Madison Ave., at 93rd St. Spend an hour here, and you’ll leave inspired to shorten TV time even more. So successful is the store’s trickle-down bookishness that just over a year ago, Corner launched the New York Kids Review of Books, a quarterly newsletter featuring local literary critics, all under 15. 2319 Frederick Douglass Blvd., near 124th St.
A block from the Apollo, this Harlem gem displays an impressive selection of African-American literature and reference books for kids and parents. For young readers (or those who read to them), there’s everything from Dora the Explorer to Nigerian folk tales; for older kids, Zora Neale Hurston, Ralph Ellison, and more. Story time is Saturdays at 2 p.m.
2488 Broadway, at 92nd St.
Stacked around the large window in the back is a modest but satisfying selection of kids’ books and parenting literature. Each category is sectioned off with a delicate string of white lights and labeled with those fridge-magnet alphabet letters of everyone’s childhood. Bilinguals will appreciate the foreign-language children’s books. 1018 Lexington Ave., near 73rd St. 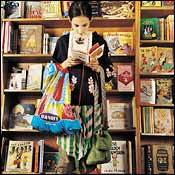 This devotedly literary shop boasts a refined children’s-book collection that occupies a good quarter of the store, and notably steers clear of movie- and merchandise-inspired titles. Instead, pick up decidedly more highbrow fare like Chasing Vermeer, a kind of Da Vinci Code for the young-adult set.